The Events Calendar is a popular WordPress Plugin to create, manage and showcase events on WordPress sites. With more than 400,000 activate installs, it is being used by many WordPress site owners. Showing upcoming events on homepage or above the fold helps in getting noticed. Carousels are one of the most prefered way to increase user engagement on the homepage and if it can be done with these events, that will be very effective. Many people are still having a thought that carousels slow down a website or may have negative SEO impact, if you think so, please read this well written article on Why you should use a carousel. Most of the e-commerce websites or Events Websites use carousels on their homepage or even in sidebars to make the page more engaging. Also the motive is to provide more information about the events happening in near future. Now if you want to show The Events Calendar data in the form of a carousel, it is very easy to do with SliderVilla WordPress Sliders. All SliderVilla Sliders are 100% compatible with The Events Calendar and Events Manager WordPress Plugin. What Type of Events Sliders are Possible? So based on these auto fetched data, you can embed these 3 types of slider by just pasting a shortcode. And apart from these, if you want to create an event slider with few selected events, that is also possible by manually adding those events to the slider. How to Create Events Slider? Any Example. One can add events slider using any SliderVilla Slider, but here I am taking an example of Roster Slider to showcase what options you get and how to create events slider using the data from The Events Calendar plugin. Here is the demo of Events Slider created with Roster. Once you install and activate Roster Slider, you get a dedicated panel on dashboard with Roster Slider options. Click on Create New to get started. First screen will show all the possible sliders using Roster Slider plugin. Here you have to select “Event Calendar” from the Events option. Note that, Event Calendar option only appear if The Events Calendar plugin is active on your dashboard. Roster Slider auto fetches data from The Events Calendar as well as Events Manager WordPress Plugins. Here you get an option to choose whether you want Future Events Slider, Past Events SLider or Recent Events Slider. Once selected and slider name entered, Roster will ask to choose from the preset designs or skins. Once you select these, the slider will start appearing under “Preview” panel on the Easy Builder page of Roster. Widget – Drag and Drop Roster Slider Simple widget and select the slider name to embed inside the widget ready areas such as sidebar, footer etc. Popular events websites are utilising the positive sides of carousels such as boost user engagement, save space, showcase more content, grab attention etc. 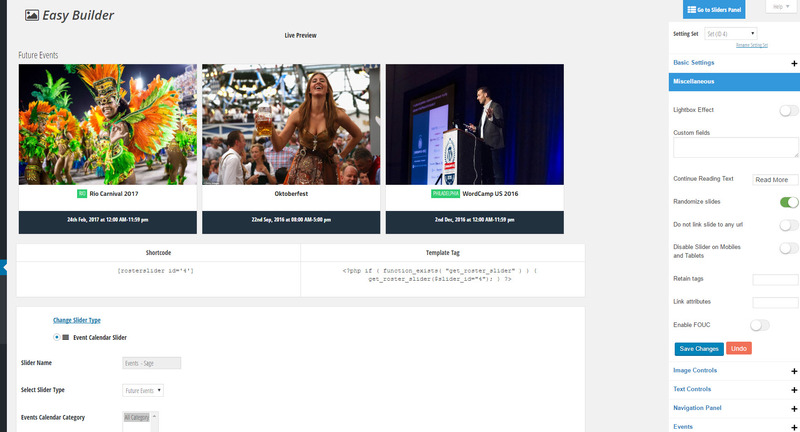 Go ahead and embed Events Slider on your existing website and start showcasing the events inside a slider in no time. SliderVilla Slider plugins works great on almost all WordPress themes – free and premium. 19+ Premium and Free sliders to create WooCommerce Product Slider, Events Slider, WordPress Category/Tag/Post Slider, Social Media Slider and many more.